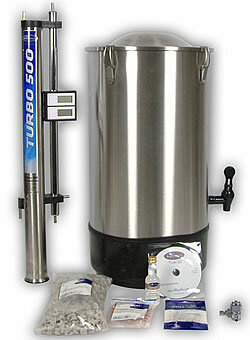 The Turbo 500 Distillation System is designed to produce high purity alcohol and give maximum alcohol recovery. High quality alcohol made with the T500 can be used to make high quality, commercial grade, clear spirits such as Gin, White Rum and Vodka as well as any of the other spirits and liqueurs in the Still Spirits Essences range. Designed and assembled in New Zealand. The worldÕs most advanced fractionating column for home use. Please note that alcohol distillation is illegal in Canada and the United States unless you are licensed to operate a commercial still. It is allowed in other countries such as New Zealand. Laws are always changing so please check with your local authorities for the current laws concerning alcohol distillation in your country.